holy boxes, batman! how much stuff does a girl need?! i have reached another milestone. i hesitate to call myself an "adult" - perhaps a better way to say it would be "independent entity living on a different continent with my husband" (IELOADCWMH - yeah, that really rolls off the tongue) - but for all intents and purposes, i no longer rely on my parents for absolutely everything. 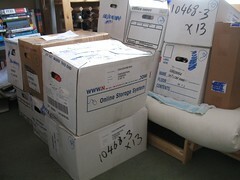 which means that storing all this stuff is now my problem. too bad for s that it's his problem, too! while i was packing the boxes at my parents' house in june, i managed to throw out almost as much as i kept. and still, the piles of things i couldn't bear to live without! one advantage to moving as many times as i have is that i have actually got my belongings down to a minimum. maybe minimum is the wrong word. reasonable amount depending on your point of view? most of the things i kept are old photo albums, letters, jewelry, trinkets, toys, yearbooks. the irreplaceable stuff that takes me back to a time or place or friend or really bad haircut. souvenirs from japan. keepsakes from the salt lake city olympics. the entire calvin & hobbes collection. asterix books in french and italian. one of those flat rubik's magic puzzles - even s was playing with it. these things are important! authentic 80s paraphernalia, dude. it was like, rad being 13 in 1986.
so the question is where will we put it all? now that i have gone from big hair and neon accessories to pilates classes and trying to eat more organic food, i guess there's only one solution for a 30-something consumer like me: IKEA. good thing there's a bank holiday coming up this month! congrats s! she's "all together now..."